Some of the links in this article may be "affiliate links," which means if you click on an affiliate link and purchase the item, we will receive a commission (at no cost to you). 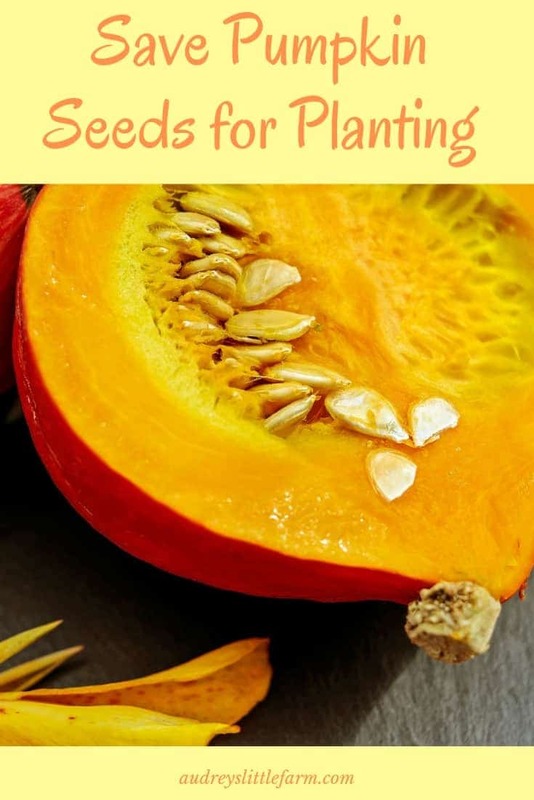 Are you wondering if you can save the seeds from the pumpkins that you already have? Well thankfully saving pumpkin seeds for growing is super easy! There are many kinds of pumpkins that you can keep the seeds from. Jack o lanterns, pumpkins leftover from fall decorations, succulent pumpkins, and likely many others. Pumpkins are awesome because if they aren’t carved they can literally last months. I made succulent topped pumpkins in fall and I just barely in March cut them open to save the seeds! These pumpkins lasted over 6 months! Jack o lanterns on the other hand are likely going to rot within a week or so. So when you are carving out your jack o lantern save the seeds for planting next year instead of throwing them away. This year I am super excited because I am finally going to plant my own pumpkin patch. As I started searching online for pumpkins I found so many great ones to choose from. 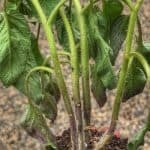 I found beautiful and unique heirloom pumpkins as well your common pumpkins for jack o lanterns. But like I mentioned, I just cut open pumpkins that I still had sitting out from fall. So instead of buying seeds I am drying out my own seeds and I am going to plant those! Although, knowing me, I’ll probably still buy some seeds if I pass by a unique variety in the store. But I am going to plant a majority of my pumpkins from seeds I saved, so I am still saving some money right! 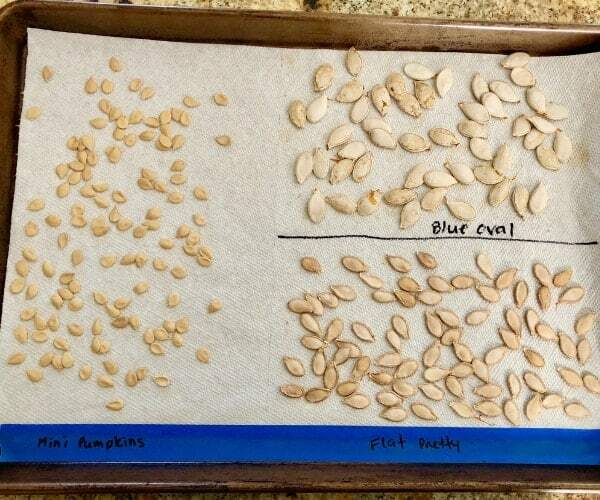 All you will need to do is gather the pumpkin seeds, wash them, let them dry, and then you will be ready to plant! If you are saving seeds from a jack o lantern then as soon as you carve out the pumpkin you should wash and dry the seeds. 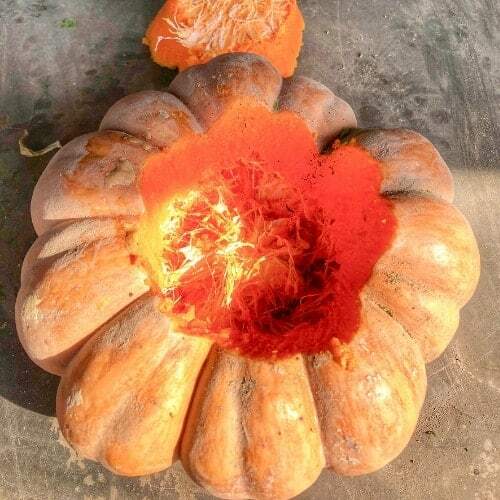 If you have a pumpkin that is not carved then at some point before it rots, or just as it’s beginning to get soft, cut it open and scoop out the seeds. Some of the pumpkins that I cut open this year were just barely rotting and as I scooped out the seeds I noticed that many of them were already sprouting! Since the pumpkin was so moist inside the germinated seeds were all alive and so I planted them straight into pots. Within 5 days I already had pumpkin plants sprouting! So if you happen to find germinated seeds within your pumpkin plant them right away so they can keep on growing! Once you have scooped out the seeds from the pumpkin you need to clean them. I put my seeds into a colander and then wash them under running water. Once you get all of the pumpkin guts off of the seeds then dump then onto a kitchen towel. Then use a paper towel and pat the seeds dry while they are spread out on the towel. Depending on how wet they are, I will sometimes transfer them to another dry kitchen towel and dry them off one more time before transferring them to a tray for their final drying process. 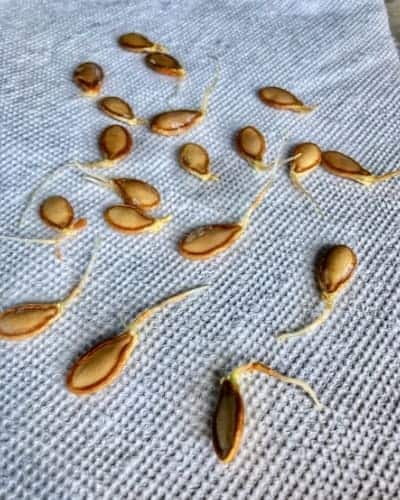 After patting the seeds dry, spread the seeds in a single layer on a cookie sheet lined with wax paper or paper towels. If the seeds are still moist they may stick to paper towels so using something such as wax paper is a good idea because the seeds won’t stick. If you have multiple varieties of pumpkin seeds drying at once you can separate them into their own section of the pan and then use a sharpie marker to label. I used masking tape to tape down the paper towels to make sure they wouldn’t move on the pan. Then I wrote on the tape what each variety of seed was. Place your seeds in a cool dry place for at least a week before storing. 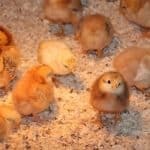 You should allow them to dry for at least a couple weeks though, to ensure that they are fully dried out. Mine have been drying for about a week and they seem pretty dry already but I am going to give them a couple weeks before putting them in seed envelopes. Once your pumpkin seeds have completely dried out they will need to be stored in the proper place. Put them in a paper envelope and then store them in a place that is consistently cool, dark and dry. Such as a cabinet, closet, or dresser drawer. The average seed storage life span for pumpkins is 4 years. Although, your best germination rates are when seeds are newest. So keep in mind that the older the seeds get the lower your germination rate may be. Saving seeds is fun and rewarding. So I hope you enjoy saving pumpkin seeds for growing later! 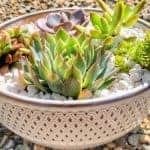 It’s so quick and easy and it saves you some money when it comes time to planting! Hi there, I'm Audrey! I am so excited to have you here! 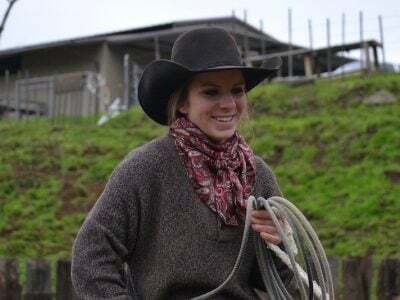 I am a farm girl, cowgirl, and homesteader and I can't wait to share great articles with you on gardening, raising chickens, baking and more... Life is all about finding joy in the simple things!